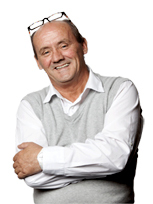 Born in Dublin 1955 into modest means, Brendan O’ Carroll is a prolific author, actor, director, scriptwriter, playwright, video star as well as a stand up comic, the Brendan O’Carroll story began very modestly. His mother Maureen O’Carroll was a Labour TD (MP) and a huge influence on his life. He left school at 12 with a myriad of jobs. The real turning point in Brendan’s career was his first appearance in 1993, on ”The Late Late Show”, Irelands longest running chat show, also shown weekly on Channel 4 in the UK. The studio audience and the viewers loved him and the thirty-five minute interview that followed propelled Brendan to the top of the stardom ladder. In 1994 he was voted Irelands No 1 Variety Entertainer at the National Entertainment Awards. The radio show “Mrs. 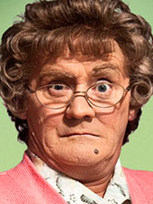 Browns Boys”, originally heard on RTE an Irish radio station in 1992, written by and starring Brendan, had a huge daily audience on 2FM and led to the creation of Agnes Brown as the central character in Brendan’s first novel, “The Mammy”, published in 1994. In 2010 O’Carroll was approached to write a television series based on the stage show. RTE One subsequently bought the broadcast rights and in the UK the BBC bought the rights, first episode was shown February 2011. Following the success of the first series RTE and the BBC commissioned a second series – and after good ratings the BBC commissioned a third series. O’Carroll described the commission as “an extraordinary gift and we genuinely don’t take it lightly. We’re overwhelmed with the support of the audience”. The show has the highest A1 (Audience Appreciation) ratings of any BBC Comedy and has won UK and Scottish BAFTA Awards. Brendan’s unique talent and approach to success over adversity makes him the perfect choice for a UK or USA Corporate audience.